You might think of a homestay as the kind of experience best left to backpackers on a budget. But as I brush past—and almost topple—a row of second-century antique vases on the way to breakfast, I realise that not all homestays are created equal. I’m the guest of Loan Foster, who might just be Hanoi’s most accomplished hostess. At various times a businesswoman, archaeologist, interior designer, fixer, restaurateur, antiques dealer, and honorary consul for Uruguay, Loan is a product of Vietnamese high society who was educated in the lycée system before the family emigrated to France. Loan returned to Vietnam in the mid-1990s as the 19-year-old American trade embargo was lifted. Fluent in seven languages, she was one of the first to set up business as an intermediary between the Vietnamese government and the multinationals looking to get into the country. In 2014, Loan set up Journeys to the East, a bespoke tour operator, with the express objective of proving that there is something to Vietnam beyond the tried-and-tested routes, or the backpacker experience. The company offers fully customised itineraries and the kind of unique experiences that can only be arranged when your host knows everyone worth knowing. Loan’s time as a bespoke guide to her country dates back to 1995, when legendary hotelier Robert Burns, the founder of the Regent group, asked her to research locations across the country for luxury resorts. The experience reawakened Loan to the beauty of her motherland at a time when few knew anything about Vietnam. She has since shown off her country to the great and the good—including Hillary Clinton and Jacques Chirac—and now she’s showing it off to me. The family compound sits in the exclusive enclave on Hanoi’s West Lake, in a collection of three adjoining French colonial-style buildings Loan has bought over the years. The houses and everything in them are testament to Loan’s aesthetic, one that cherishes the country’s past: traditional and colonial alike. One house, Villa La Rose, serves as a homestay for guests of Journeys to the East. Behind the walls of the villa, the ideal base from which to explore the Vietnamese capital, the din of motorbike horns fades away. Colonial windows and pillars beneath lofty ceilings frame the antiques displayed in nooks and niches, while the walls are hung with the work of leading Vietnamese artists. The rooms are appointed with an eclectic mix of unique antique pieces. From traditional French dressers to Chinese-style screens and colonial-era make-up tables, they were all collected by Loan herself, who scoured the country for unsung treasures of Vietnam’s past. It’s a beautiful place to stay, but Loan’s own home next door, Villa La Residence, is in a league of its own. The ground floor is a museum-worthy treasure trove of antiques set among colonial-style arches and walls painted a uniquely rich Vietnamese yellow. Ancient Buddha statues stand beside priceless Chinese vases, antique day beds, Bleu de Huê porcelain and rich lacquerwork. The best is yet to come. Loan leads me upstairs, into a living room that takes my breath away: a stunning slice of tradition in the middle of modern-day Hanoi. Ornate pillars hold up an elegantly pitched wooden roof and doors, all adorned with intricate carving. It’s anachronistic yet perfect, a modern living space inside a historic frame. The timbers encompassing the room are from a traditional ancestral hall dating back to 1865 and once owned by an influential court mandarin. Loan was inspired by a trip to Hangzhou, China, and her discovery of the wooden teahouses that line that city’s own West Lake. And so she set out to the villages of Vietnam to find one. When she finally came across the building in a village an hour out of Hanoi, she discovered the villagers had no use for such an old wooden relic—in fact, they were about to knock it down. So Loan bought the entire building. “I hired the whole village,” she remembers. “They took down the house and numbered every piece,” and they were all carefully transported to Hanoi. With no space to reassemble it on the ground, Loan came up with an ingenious solution: turn it into a second storey. It’s this eye for the original, and her ability to honour the historic in a new context, that makes Loan such a good tour guide. Early one morning we pile into a car for the three-hour journey to Ninh Binh, southwest of Hanoi. The landscape on the way is flat, less impressive than the dramatic valleys and lush greens of central and south Vietnam. But as we get closer, the jagged outlines of karst mountains begin to jut up across the landscape. The scenery also grows more industrial; the beautiful limestone peaks are a ready source of lime for the cement factories that dot the landscape, which occasionally seem to dwarf the mountains themselves. 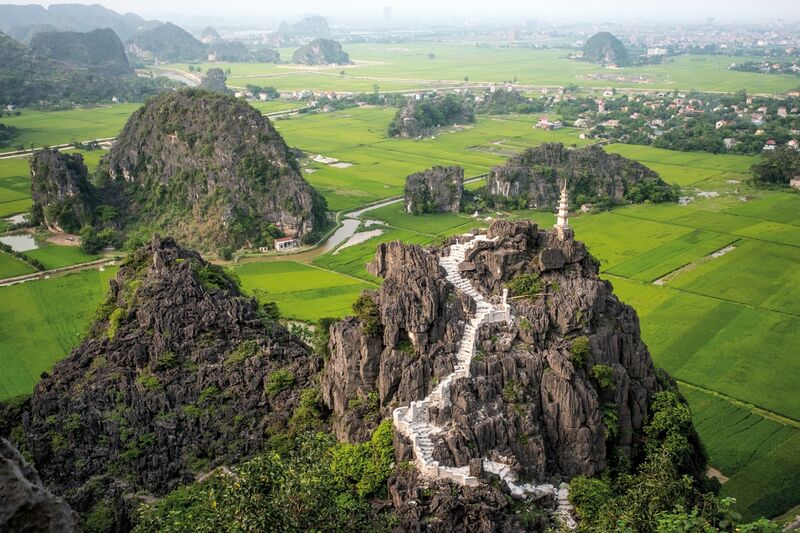 However, as we approach Ninh Binh itself, the factories disappear and nature reasserts itself. Our base, the boutique Tam Coc Garden resort, is surrounded by a vista of karst peaks rising from the ubiquitous rice paddies. We hop onto narrow sampans rowed by seemingly tireless boatwomen, who paddle us through the narrow waterways of Ninh Binh and into silent valleys, the only sound the slap of oars on the water and the occasional monkey in the hills. We explore waterlogged caves and feel the swoosh of bats overhead, and climb the 450 steps of Hang Mua Peak, catching our breath as we take in a 360-degree view of the sampan-dotted waterways below. On our final evening in Ninh Binh, we board a sampan as sunset approaches for an experience that only someone with Loan’s level of access can provide. The river is quiet now, without the tourists who can clog the waterways during the day. A bottle of champagne chills in an ice bucket as we push off. Another boat sets out alongside, but this one with a musician and his two-stringed dan nhi fiddle. A lilting melody floats across to us as we glide in the dimming light. We pop champagne to toast the setting sun, and the rich greenery around us darkens to blue. The musician falls silent, as if overawed by the mountains that hem us in. The final notes are absorbed by the water, and all is still. Then, in the distance, the low thrum of drums, drawing us onwards. Cymbals take up the rhythm. We round a bend in the river and are greeted by a row of flaming torches lighting the way. Drummers wait in the twilight and as we alight, they lead us through paddyfields to the 700-year-old Thai Vi temple. We step into the courtyard and the temple’s pavilion glows a warm orange; lanterns from Hoi An illuminate a table set for a very private dinner. Over dish after dish prepared by Loan’s personal chef—the whole team has come down from Hanoi for the evening—we’re treated to traditional songs and dances by performers from the nearby village. It’s late, but the temple watches over us in the warm light of the lanterns. We drink to Vietnam, to hospitality, to discovery. The author was a guest of Journeys to the East, which offers a wide range of bespoke experiences in Vietnam and elsewhere in Asia, including Bai Tu Long Bay and Ha Giang.